The Legion pre-patch brings chaos! And not just demons, but also the weird balance that results from gaining class changes while still missing key expansion-only components, like artifact weapons. But What If I Hate the New Brewmaster? For all tanks, staying alive is going to get more difficult. Universally, the tankiness of tanks has been reduced. It’s probably going to hurt at first, but for a number of reasons it’s for the better. Most Warlords content has been nerfed to compensate for this. It will feel more natural in Legion, and for now our limbo in Hellfire Citadel or whatever content you’re doing for the next few weeks will be temporary. Be cautious and prepared to take things slow. Tanks are supposed to be weaker now, and active mitigation has changed significantly, such that you have to time it well. Gone are the days where you can keep Shuffle up all the time and your entire mitigation depends on using an extremely powerful, cheap absorb every time you feel threatened. Defensive cooldowns have been nerfed. Lower mitigation, longer cooldowns. Active mitigation uptime and potency reduced across the board. Resolve is gone. Instead, heal and absorb abilities scale through attack power or health or some combination of both. I’ll get into the specific changes in a bit, but there are some high level changes that you need to be aware of before diving in. Legion Brewmaster plays very differently from Warlords Brewmaster, though surprisingly similar to Mists Brewmaster. Warlords Brewmaster depended on Guard and Expel Harm to survive anything, and all their other AM, like Shuffle and Stagger, was neutered enough to be safely ignored. Tanaan Jungle: If you have 10,000 Apexis Crystals to spare, you can buy a 650 weapon, created by Baleful Armament when your loot-spec is brewmaster, from Ravenspeaker Thelnaas in Tanaan Jungle. Demon Invasions: If you’re lucky, any chest obtained from these events might include a unique 700 weapon. 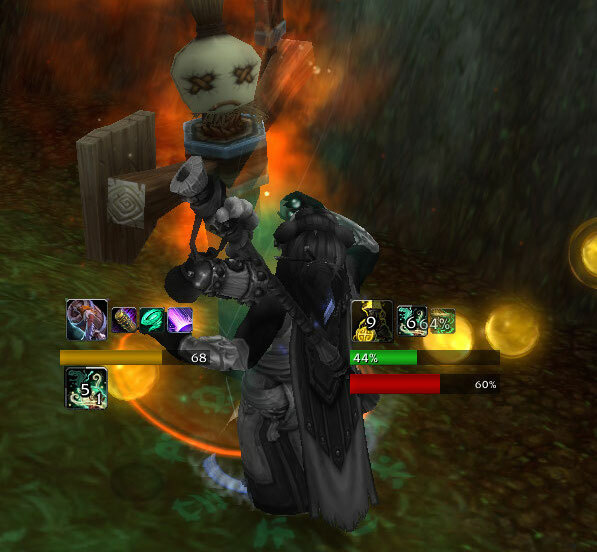 The weapon to look out for is Fel Barbed Spear. Broken Shore Scenario: Not be immediately available at the launch of 7.0, but if you’re starting later you can get a 685 weapon, Stormwind Vanguard Polearm. You won’t get your artifact weapon or unlock your class hall until Legion is officially launched. Chi is no longer a resource for brewmasters. Haste now reduces the cooldown of Keg Smash, Ironskin Brew, Purifying Brew. Tiger Palm: Merged with Jab, now costs energy, reduces remaining cooldown on brews by 1s. Blackout Kick: Renamed Blackout Strike. No longer has a chi cost or applies active mitigation. Keg Smash: Now reduces the remaining cooldown on your Brews by 4 sec. Breath of Fire: No longer has a chi cost. Now your big AoE burst skill. Ironskin Brew: Brand new, increases your Stagger amount by an additional 40% for 6 sec, shares charges with Purifying Brew. Gift of the Ox: Now heals for roughly 12% health, no longer increased by multistrike. Purifying Brew: Now shares charges with Ironskin Brew, only reduces stagger by 50%, down from 100%. Expel Harm: No longer a heal in its own right, but heals by drawing distant ox orbs to you for a large heal. Fortifying Brew: Like all big defensive abilities, damage reduction was reduced and cooldown was increased. Cooldown is now reduced by Keg Smash and Tiger Palm. Touch of Death: now Windwalker only. IRONSKIN BREW : Keep active when damage reduction is needed. You usually need damage reduction early in a pull, to counter an enemy’s special attack, or when your health is unstable. If you have other defensive abilities available, like some Gift of the Ox orbs or high stacks of Elusive Brawler, you probably don’t need to use Ironskin Brew. PURIFYING BREW : Use when your Stagger debuff is high. Typically, that means you should purify a Heavy Stagger, leave Moderate Stagger up to your judgement, and ignore Light Stagger. This ability is necessary to reduce damage in conjunction with Ironskin Brew, and you’ll be very difficult to keep alive without it. GIFT OF THE OX : React to low health by shuffling side to side for golden Gift of the Ox orbs, if they’re there. If your orbs are out of range, use Expel Harm. Ox orbs spawn based on damage taken. KEG SMASH : Use to pull, and continue using on cooldown to generate brews and AoE threat. Try to keep 40 energy on hand when it nears the end of its cooldown so you can cast it immediately. TIGER PALM : Use when you have high energy to generate brews when Keg Smash isn’t available. BREATH OF FIRE : Use for significant damage and threat in AoE. Continue to use to fill empty spaces in your rotation. BLACKOUT STRIKE : Use to fill empty spots in your rotation for damage and additional effects from talents and artifact traits. One thing to note is that Gift of the Ox orb rate will be frustratingly uncommon until we get a key trait on our artifacts, especially in low damage situations like solo content. Read the guide for more detailed information! Brewmasters got a lot of new talents, a few shuffled talent tiers, and many redesigned talents. Eye of the Tiger: New talent, passive healing. Chi Burst and Chi Wave remained unchanged. Chi Torpedo: Changed tiers, no longer deals damage or healing, but still moves further than regular Roll and now applies a small movement speed buff (merged with Momentum). Tiger’s Lust and Celerity remain unchanged. Light Brewing: New talent, extra brew charges. Black Ox Brew: New talent, refills brew charges and energy. Gift of the Mists: New talent, increases chance for Gift of the Ox orbs. Black Ox Statue: Now a talent instead of baseline. Ring of Peace and Leg Sweep remain unchanged. Healing Elixir: No longer heals on brews. Now an active ability, in addition to passively healing at low health. Diffuse Magic: Like all big defensive abilities, damage reduction was reduced and cooldown was increased. Dampen Harm: Like all big defensive abilities, damage reduction was reduced and cooldown was increased. Rushing Jade Wind: No longer has an energy cost for brewmasters, which makes it a good rotation filler as well as AoE. Invoke Niuzao, the Black Ox: Renamed from Invoke Xuen, the White Tiger. Now a better tank. Special Delivery: New talent, passive AoE damage. Elusive Dance: New talent, increases potency of Purifying Brew. Blackout Combo: New talent, increases rotational complexity, personal damage, and damage reduction. High Tolerance: New talent, improves Stagger. Read the guide for more detailed info on talents, including some suggested starter builds! Haste is the active mitigation stat. It now reduces cooldown on Keg Smash, Ironskin Brew, Purifying Brew. Haste is cool now! Critical strike is the healing stat. Beyond increasing our own chance to heal for an increased amount, it also increases healing via Celestial Fortune, which gives you chance equal to your critical strike to duplicate a portion of all healing you receive. Mastery is the dodge stat. It increases predictable Dodge via Mastery: Elusive Brawler, where every time you don’t dodge your chance to dodge is increased. Versatility is the hybrid stat. It increases damage, healing, and damage reduction, as it always has. Read the guide for more information on stats! They’ve been updated! Go to the WeakAuras page for the import strings. This is bound to come up. It’s understandable, brewmasters changed significantly. We’re basically a different class with similar themes to before. If you really loved Guard (and who didn’t, it was ridiculously good), you’re about to log into a class with few big cooldowns. If you really loved self-healing, you’ll be disappointed by the conditional nature of brewmaster healing in 7.0. I personally find it a huge improvement. Legion Brewmaster is a beautifully elegant tank that prepares for everything and manages a plethora of various unique resources, but we’re all allowed our different opinions. So what do you do if you find that you can’t stand the new Brewmaster? First, I’d advise you to try it out. Change is scary, but you might end up appreciating it. Keep in mind that this period before the actual expansion launch is weird. All classes are incomplete and imbalanced, and it’s not worth rebalancing for 6 weeks of transition. Some awkwardness will feel much better after Legion. Which Tank Might You Like? Try Death Knight! They have a few new abilities, but they still build their rotation around Death Strike. Death Knights and Vengeance Demon Hunters have excellent and versatile healing, especially in solo situations. Vengeance Demon Hunters, Guardian Druids, and Protection Warriors have spammable abilities to fill every GCD. If you are expecting to reroll to Vengeance, I have a guide for that too! They won’t be released for a few weeks, but when they do I’ll have a full post comparing Vengeance and Brewmaster in every detail.